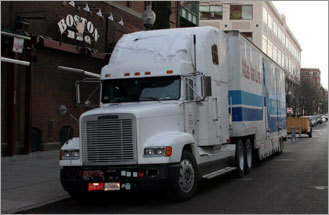 In what has become an annual sign that spring is around the corner in Boston, “Truck Day” will arrive on Friday, Feb. 6, when the Red Sox moving van will be loaded at Fenway Park for the 1,467-mile trek to the team’s spring training complex on Edison Ave. in Fort Myers, Fla. The team confirmed the equipment truck’s departure date this afternoon. The truck is expected to arrive in Fort Myers on Monday, Feb. 9. In the past, the 18-wheeler has departed from Fenway Park at the players’ parking lot entrance on Van Ness St., followed in procession by Fenway ambassadors, Red Sox staff, and Wally the Green Monster tossing gifts to fans from a flat-bed truck. If you can’t wait to see the truck on Feb. 6, you can reminisce by taking a look back at last year’s ‘Truck Day’ photos. Reporting day for Red Sox pitchers and catchers is Thursday, Feb. 12. First workout for Red Sox pitchers and catchers is Saturday, Feb. 14. In related news, the Red Sox are putting tickets for most regular-season home games for sale on Saturday, Jan. 24, beginning at 10 a.m. Fans will be able to purchase tickets to all games at Fenway Park — with the exception of Opening Day and all games with the Yankees. For those games, a special random drawing will be held at a later date. Tickets for Green Monster seats and right field roof deck tables will also be sold via the random drawing. To purchase tickets, fans can log on to redsox.com. Fans who do not have Internet access or who require ADA accessible seating may also call 1-877-REDSOX9 for tickets. Hearing-impaired fans can call the Red Sox TTY line at (617) 226-6644.